My family and I went to Taj President hotel for dinner a few days ago. This is a review of the Trattoria restaurant that we visited. We were celebrating in a way, since it looks as if my future path is becoming a little clearer compared to where I was a month ago when I returned from Saudi Arabia, having finished my fourth year contract there. The food was delicious, and even better was the eminently helpful service. We had insider help, so we got some specially crafted dishes with extra portions, and a discount to boot! All in all, a wonderful evening was had by us. 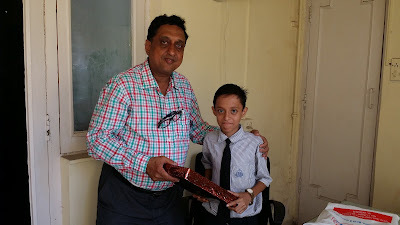 Yogesh is born on the 1st of August in 2001. He hails from Bandra West. 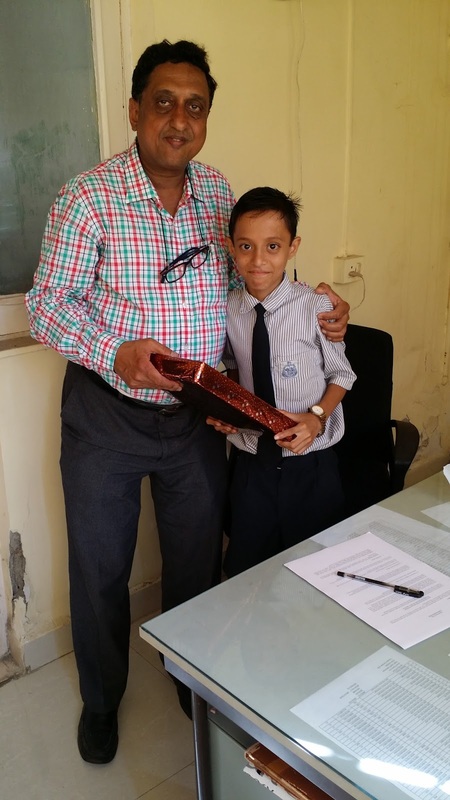 I have adopted him to support his life and education through World Vision, a NGO that helps community development through adoption of children (for the purpose of educating etc.) He and I met at the office of the NGO in Guru Tegh Bahadur Nagar in Mumbai. I was thrilled to meet him and his father. I intend to look after his welfare as long as possible. The current rules of the NGO allow sponsors to commit themselves to their wards until the latter have turned 18. That leaves me with about 4 years. If I want to continue my sponsorship beyond that, I must contact the NGO separately with my request to allow me to extend my sponsorship. I presented him with a simple jeans and Tee shirt and some chocolates. Here, we are posing just at the entry of the nearest railway station, a very clean GTBN station, located on the Harbour branch of Central Railway. Mount Everest has always beckoned people to try and conquer it, and reaching the pinnacle of this huge mountain is often equated with the biggest accomplishment anyone can have in this world in the field of adventure and thrill, in the field of endurance, stamina, courage and absolute exhilaration. This is a movie based on a true story. 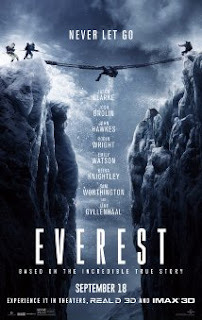 The year is 1996, and the story traces the adventure of two teams of Everest climbers led by the expedition head, their backup teams and support and the actual travellers who have paid money to these expeditions to reach the top of Mount Everest. The two teams are led by Robert Hall (played by Jason Clarke) (Adventure Consultants) and Scott Fisher (Jake Gyllenhaal) (Mountain Madness), and they come together for synergistic reasons. Some of their climbers include a mailman (Doug Hansen - John Hawkes) who is doing this for glory, a seasoned mountaineer (Beck Weathers - Josh Brolin), and a Japanese woman (Yasuko Namba - Naoko Mori) who has already scaled 6 summits and hopes to crown her experience with this, her 7th climb, to Everest. This story is a thriller all right. The camera work, special effects and the narrative story are top class. There are reports that the shooting was not only done in Nepal, but at several other places in the world, including the Alps in Italy and some studios in Rome and the U.S. The story starts on a positive note, and continues to remain hopeful until when the climbers reach the Hillary steps, a very narrow ledge on the way to the summit, where the leaders and guides have to perform the additional duty of installing fixed ropes before the climbers can go up; then, a storm begins to grow upon the climbers. The rest of the story is the real story of how the climbers and the guides had to battle the elements to survive; many perish, and some return successfully to tell their story to their family and to the world. See this movie if you love to see a technically well-made movie with a strong story line. It is filmed in 3D, but the movie had few moments to justify its 3D avatar. Having returned from KSA since over three weeks, my career path is in a limbo, thanks to a technical hitch with my licensing process with the UK's General Medical Council (the GMC). I am also pursuing other tracks in case the UK licensing process does not go through. And that, friends, is the first time I have disclosed my plans for the coming months. I am sitting here before my old laptop (an Acer Aspire) that I had purchased in November 2011, a week before I went to KSA for the first time. Two and a half years later, I had purchased a newer, Windows 8 touch-screen laptop - a Dell Inspiron - but in the last week, its monitor has died off and I have had to give it to a service center to repair it. So, as I said, here I am, with my Acer on a stable, Windows 7 OS, working again without a touch interface, doing my thing. 1. I renewed my passport. Strictly speaking, my passport wasn't due for a renewal until the spring of next year, but I went to an agent who booked my appointment online with the PSK (Passport Seva Kendra) at Lower Parel inside the Kamala Mills compound. On the appointed day, I was expecting a raggedy office with long tireless queues, absent workers from sweaty desks, and the typical busy milieu we have come to expect in governmental offices. Imagine my pleasant surprise when the PSK turned out to be a well-appointed air-conditioned suite of offices on the ground floor of the rear-most building. The queues were orderly. Although there was a rigmarole of forming one queue, submitting your documents there, then going on to another queue for biometrics, then a third queue for submission of your original documents for instant verification and then, a final one where they bid farewell to you and hand you a paper which you exchange for a receipt at the exit counter (the fifth queue - albeit a very small one). There was a snack counter, clean toilets, plenty of metal seats, and a generally friendly atmosphere that I thought was pretty nifty. As soon as I left the office, I received my first SMS that my passport printing had begun! Six days later and after a regular receipt of SMSs, I received my new passport at my doorstep. 2. I travelled by the Metro rail from Andheri station to the Airport road station and back. I had gone to my relative's residence to condole the death of my aunty Zehrafaiji, who passed away on the 1st of September (just a few days before I came back from KSA). It was a Sunday morning when I went. The local train that took me from Dockyard road to Bandra (harbour line) and from Bandra to Andheri (Western line) was the usual crowded mess that Mumbai's local railways are known for. The Metro railways were something else entirely! Clean, largely airy platforms, automated kiosks for entering and leaving the concourse, food courts, and superbly air-conditioned trains made the small trip really memorable! The tickets are pricey, but the price is well worth it, as you are in a world-class railway with passengers not unlike you, and not a nameless, sweaty, smelly crowd that you are yourself a part of in the local network. 3. I visited the Kokilaben Dhirubhai Ambani Hospital. Of course, I knew that this is a hi-tech, state of the art hospital in the western suburb of Andheri. However, I was not prepared for the level of security there. In my life of over 55 years, this was the first time I saw a queue for visitors! They were aligned perfectly, moving peacefully as they approached the metal detector gate and the frisking security-men. Water bottles and food were meticulously looked for and removed from the possession of unsuspecting visitors. As I had no bags, I was allowed to go in easily. The ICU where my friend was admitted for a post-op observation is on the third floor of the huge monolithic building. Entry to this floor is blocked for visitors. You can bypass this by getting off on the second floor and using the stairs to reach the third floor. My friend's wife received me there, and guided me to the ICU door, where a security man gave me a tag for the bed my friend was on and allowed me to go in and meet my friend. The ICU was spacious, and there was a quietly efficient staff performing their duties as I approached my friend's cubicle, which was at the far end on the opposite side. All the equipment was working fine. A nurse came in a few minutes into my visit, checked all the inputs and outputs, sat on a custom chair-table and jotted down her findings. After some time, I left, and went down to the lobby. They have a complete food court with all the major brands of food chains (like McD, CCD, Subway, etc. ), a book shop (Crossword), a chaat shop (with sev-puri, etc. ), a beauty salon, a pharmacy and a provisionist/ The admissions area, the discharge area, and the information and reception area were all clearly demarcated and segregated. There was a busy hum in the entire lobby, with over a 100 people there. There were clean wash-rooms (a bit out of the center, though), and two banks of elevators - one for visitors to the various diagnostic and day-care service areas, and the other, for inpatient floors. I must say the hospital ended up impressing me thoroughly. 4. I visited my newest adoptee at Guru Tegh Bahadur Nagar (GTBN). 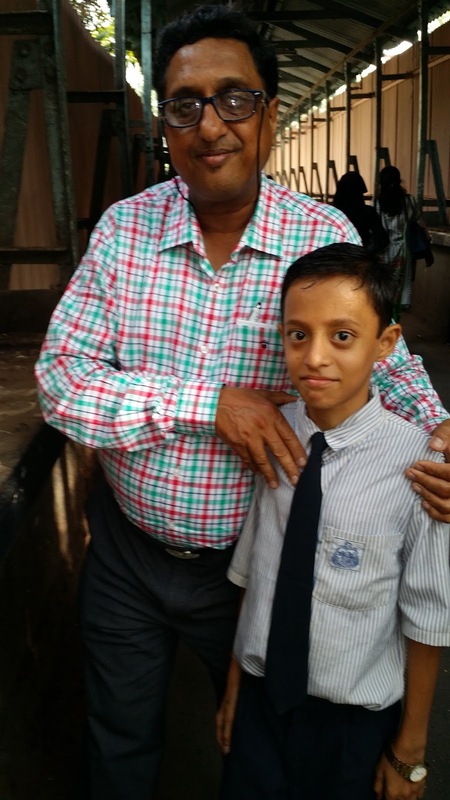 Today afternoon, I went to GTBN to the office of World Vision India to meet with Yogesh Kadu, my newest adoptee. This boy, all of 14, is a slight, shy and intelligent boy of Maharashtrian parents, and the youngest of three siblings. Both his older siblings are daughters. His father was with him. I had gone and purchased a set of clothes and some chocolates for him yesterday and got the items gift-wrapped, so handing them over to Yogesh in front of the World Vision staff was a great experience. I am adding this experience to this enty in my blog to encourage every reader to do an act of charity - each according to their budget. My aim is to sponsor ten children, and after Yogesh, who is my third adoptee (the others are Sabia from Kolkata and Sakshi from Mumbai), I have just today added funds to adopt Shruti from Gujarat. There is immense sense of fulfillment when you see your adoptees going out into the world and making something of themselves. Check out the pics in my post here. That's it for now. Thank you, as always, for reading. Any Mumbaikar knows what I am talking about. 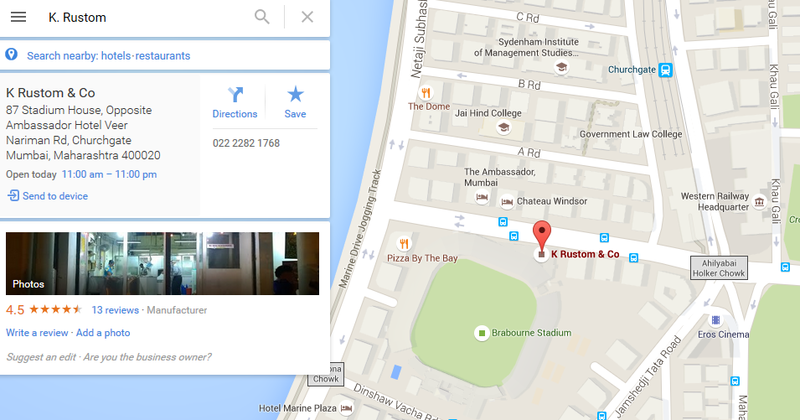 I started visiting K. Rustom and Co. in childhood, when their trademark sandwich ice creams cost Re. 0.40 each. With the passing of years, the prices increased to 0.80, then 1.50, and so on. Today, the regular range costs Rs. 60 a piece, and the premium range goes over Rs. 80 to even up to 200 per piece. I had the occasion to go there again today, after a gap of over a year. The Parsi lady who sits at the counter does little except to collect the money and to return the change. The work is done by a staff of mostly Maharashtrian workers, who flit from one customer to another with an amazing efficiency. The guy who took my order was as efficient as any of the others. A ready reckoner of sorts is stuck on the wall behind the cashier. It gives multiples of 30, of 60, of 80, and so on.These are the prices of different units of ice creams and slushes. There are the usual ice creams, and then, there are the exotic ones. For example, you can get a lychee ice cream almost throughout the year! I purchased 3 ice creams - a pistachio, a chocolate nut and a kesar-pista. For Rs. 180/= only. These three biscuit ice creams should be enough to share between the four of us. Where is this place? It is on Veer Nariman Road, the main road between Churchgate station and Pizza by the Bay. You stick to the south foot-path, passing by the Abu Dhabi Commercial Bank, then the Gaylord, then the Alankar and Wordell Chemists, and finally, you are there. It is the second shop in the CCI building complex. It is always open on all holidays, and also on normal days. You will always find customers here, from all classes of society. The place is small, and you won't find rest rooms, but there is a wash basin and drinking water. Small benches meant only for the weary customer waiting for his parcel adorn the side. Try their special ice creams and you will see why they are so popular. On most food review sites, people rave about K. Rustom and Co. Zomato has over 500 reviews, and the average rating is 4.6/5.0. The case is the same with other sites like mouthshut, burrp, etc. For larger parties, they even provide the ice creams in thermocol boxes (for which you need to pay a refundable deposit). A few days ago, I went to shop for a pair of good quality ear-phones for myself. The natural place to go for this was Lamington Road or what is now known as Dadasaheb Bhadkamkar Marg. Asking around led me to a shop recommended by several traders - this shop was known as "O Three". As I had expected, the shop occupants had a lot of ear-phones;but neither could we see a good range of ear phones, except on a rack in the rear of the shop. Now, when you go to buy ear-phones, most end up buying something in the range of INR 500 or less; I was looking for something costlier because I do feel that a good set of ear-phones should give better voice quality than the cheaper ones, that are mostly Chinese. In addition, the packaging, the accessories, etc.also make a difference. The choice was between the moderately priced "Skullcandy" and "Sennheiser" brands. Bose earphones start above 6000/=, and the noise-cancelling ones are in the stratospheric range of over 30K/pair! These, then, are the ear-phones I bought: Sennheiser CX 275s. The box pack contained the following: A pair of ear-phones with a microphone and a 3.5 mm audio jack; 2 extra pairs of differently sized ear plugs in case the one that is fitted on the phones by default does not match up to the size of your ear canals; an additional adapter for using with i-phone audio jacks; a small purse-string bag to keep the ear-phones safely, and a 2-year warranty card. All this for INR 1600! On internet b2c sites, the rates quoted are 1750, and then, on some sites, over INR 4000! My first experience with the Sennheiser brand, which is a German brand (check out their website HERE) was extremely satisfying.The voice quality, portability, etc. were very good indeed. Sennheiser has an independent website in India (see THIS LINK). They have operations in India too, and they have a toll-free access (1800-200-3632) with offices in Gurgaon, Kolkata, Mumbai and Bengaluru. You can even email them on info@sennheiserindia.com. What more can one ask for? So, to summarise, these are excellent ear-phones. Go ahead and buy them. As I cool my feet here in Mumbai, waiting for the next phase in my life to reveal itself, I decided to diversify my blog writing into reviewing stuff. This can be reviews of books, movies, electronic products, services, etc. etc. 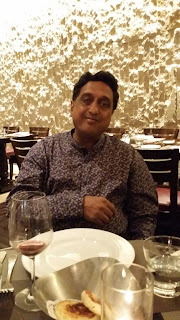 The idea is to share my thoughts with readers who visit my blog regularly. Today, I am going to talk about a restaurant that my family and I visited last week. This restaurant at the World Trade Center, Cuffe Parade is known simply as The Village, and subtitled "The Soul of India". It is one of a chain of 7 outlets in Mumbai. The way to the main door is lit up nicely, and your path is flanked by counters on the wall where they've created a village ambience. The day we went was a Sunday evening, and we expected some rush. Fortunately, there wasn't a rush. We went past the walls decorated with glass bangles, faux cow dung hanging from threads, tyres from cars and Bollywood photos and through the multi-coloured gate into the restaurant reception. A manager approached us to know how many we were, and directed us to the payment counter, where we paid the cover charges of Rs. 600 per person for an unlimited buffet-style meal. The interior was cooled by large air-conditioners placed discreetly behind tables. There were three real trees that lofted up above us, and through a net placed between three surrounding buildings. We were actually in a modified outdoors location! Rows of serving areas lay all around us on the sides of the central, open area. 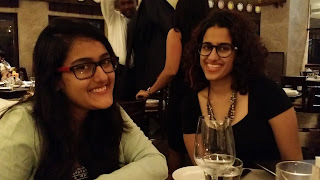 We went around, examining the various items on the menu as well as the interesting decor. There are areas made to look like village locations. Thus, we have a "Billoo barber shop", a "leddies tailler" shop, and several other similar areas. We also had a "pathshala", a "baraf-gola and drinks" station, a "sweets and dosa station", a "barbeque and rotis" station, plus the usual veg and non-veg table each. Of course, there was a chaat and pani-puri stall as well. There was a mini "bioscope" showing various village and national mnuments on turning a lever at the top, a "mini-puppet" theatre, and, as we continued through the evening, a live dance by some of the artists, in which the audience was also invited to join, a dandiya raas with audience participation, and, finally, a mini-dahi-handi (we had gone there on the eve of Gokulashthmi) where some kids were lofted on to the shoulders of the staff members, and they were asked to break a handi filled with milk. Food wasn't exceptional, but there was plenty of variety, with veg and non-veg options. 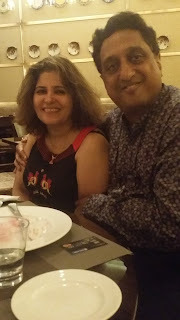 We had fish and chicken as well as paneer and veg starters, chaat, pani-puris, dosas, jalebi, main course of chicken, mutton and vegetarian dishes, with assorted rotis, biryani and pulao. One could go and have baraf golas and flavoured drinks as often as desired. A paan store was lacking, though, and I drew the manager's attention to this, and he agreed to look into it. The food was above average, but not exceptional, as I already pointed out earlier. However, at Rs. 600 for an unlimited meal, this is probably the best location in south Mumbai for an evening of fun. This is going to be a candid post, so guys, if you are expecting that four years in Saudi Arabia made me a true blue Muslim, or changed me into a deeply religious person, you have another think coming. Sure, I set out to become a better Muslim, and to a large extent, I am. I lose my temper less often; I am more kind and forgiving than I was before; I have become a lot more caring, and I share my good fortune with many others, and these, in a way, are changing me into a good human being/good Muslim. OTOH, I am still not deeply religious by the standards of Islam. I did the Hajj pilgrimage; I recite or read the Qur^an whenever I can; I pray the Namaaz, but I am definitely not doing it as often as prescribed; Diabetes prevents me from performing the fasts; and finally, I give an arbitrary zakaat from whatever I save. So, there it is, in a nutshell. At the same time, I think I am a good Muslim, because I do not indulge in anti-Islamic acts; I do not cheat, rob, steal, covet, gloat, envy, boast or act in a manner not in accordance with my principles, my health, my character or my habits. I am a better Muslim than many bearded, self-confessed religionists we see everywhere around us. They are subservient to their own agendas of greed for fame, for money, for respect, for influence, for recognition, for promotion, for sponsorship of hatred and dislike for certain specific communities or specific groups of people. So, while I do not practice the kind of rituals and protocols of Islam, many of which are specifically COMPULSORY, I do all the things mankind sees as being in line with being a good human/Muslim. Need your non-judgmental comments, friends, elders, juniors, cousins, brothers and sisters. In Mumbai, the city that "never sleeps", the city that is the "financial capital of India", the city that "is a global melting pot of people from every where, I had a pleasant experience the other day. It is when I went to the "Passport Seva Kendra" at Lower Parel, inside the Kamala Mills compound to renew my passport. The office is located right at the back of the compound, with many towering office buildings before it as you walk to the rear. At the door, a couple of security guys look at the papers you have with you and verify that you are indeed meant to come on that particular day and at that particular time (your agent made sure of the date and time when he applied for the appointment online). Once they have done that, you go past their make-shift blockade into the first room where you basically submit some of the papers which you brought with you. Then you are allotted a token number, with which you go into the second room. You join a biometrics queue (section A), and when your number is called, you are assigned a "cubicle". The lady there asks you to show her the original passport etc., then takes your photo, then gets your fingerprints, then thumbprints, then asks you whether you wish to pay Rs. 35 for the SMS service that will update you on what the office is doing regarding your passport renewal. After this, you wait for your turn to go to a third section, which is either section B (for those who are applying for a new passport) or section C (for those who have come to renew their passport). At this cubicle, they re-check your originals (I had carried a lot of papers, but they checked only my Aadhar Card and the old passport). Then, the old lady asked me to wait for a little more time, and for the last part, I went to yet another C section counter (that is NOT Cesearean section, ha ha). Here, the lady who "manned" the counter took a look at my token, made some alterations on the screen of the computer in front of her, and announced that the task was done, and I was to collect a final receipt from the "Exit counter" just near the exit. And that's it. It took nearly 2 hours, but it was a smooth affair, all in the comfort of an air-conditioned suite of rooms, with properly appointed toilets, a snack bar (the food was contracted from a third party and it was a bit pricey, but it was good) and sweet-smiling staff. Everyone stayed calm through the various stages of their application. I saw just one woman all in tears in a private glass-cubicle at one point. She was arguing something with a bunch of cops and a woman official who were all trying to placate her. I never realised what was happening, as I had to move on. As soon as I left the office, an SMS popped up ... it said "your passport has been sent for printing". Wow! Incredible for a governmental agency to achieve this level of speed, wouldn't you agree? After just 5 days in Mumbai, I am feeling like a different person altogether! No longer am I worried about how the long days will pass - there is so much to do and so many things to look after that there is barely any time to write in this blog, let alone do all the online stuff that I used to do when I was in Saudi Arabia. 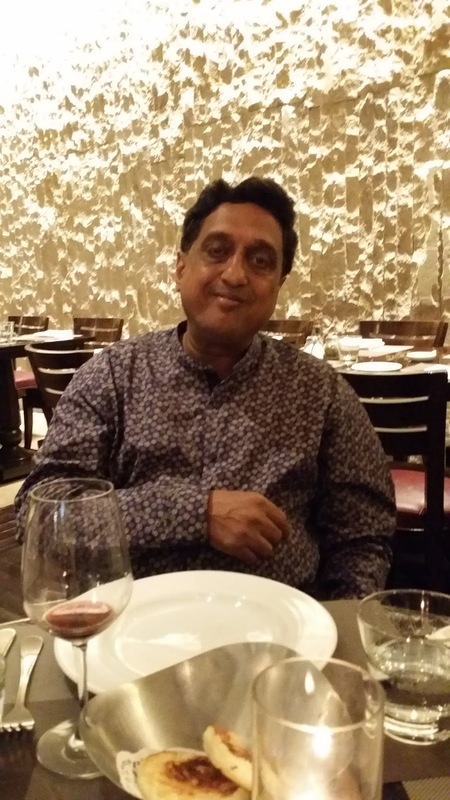 On Sunday evening, my family and I visited a new eating place called The Village - at the World Trade Center in Cuffe Parade. 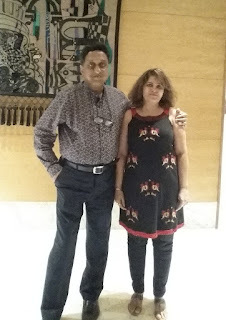 We ate good food, served in a buffet, but we also enjoyed playing Dandiya, dancing inside a horse costume, and observed a couple of young children break the Dahi Handi ... will post photos soon. It was a thoroughly enjoyable evening, I must say. The very next day, Hannah hurt her left knee in a fall while driving home on the scooter. I took her to the ortho surgeon the next morning, and we were told there was a blood collection in her knee joint, and a possible ligament injury which should be ruled out by doing a MRI (magnetic resonance imaging). Ligaments are fibrous cord-like structures that connect bones to other bones, muscles or other tissues in the body, including skin and deeper structures. We went for the MRI the next morning, and the results indicate that the orthopedic surgeon was basically right. Hannah will need to rest for a month before the knee structures return to their previous state! When she spoke to her boss, the latter took it quite good-naturedly ... an attitude I would have found hard to emulate. I went for a walk yesterday evening to the Mazgaon Garden. It was something I used to do quite regularly some years ago, but have given up in the past few years even when I am in Mumbai on a vacation. Having said that, I found it enjoyable. Met some friends and renewed contact with them. I was unable to go today, the day I am writing this ... however, I do feel it should be part of a daily routine so as to keep myself fit. Nishrin and Inas do it almost every day. I went to the passport seva kendra today to start the process of renewing my passport. This is a place located within the Kamala Mills compound on Senapati Bapat Marg ahead of High Street Phoenix. The internal offices are quite spacious, and one has to go through four queues before being issued with a receipt of your successful application. A task that took over 2 hours. After the job was over, I stopped at the nearby "Smash" gaming shamiana, took a look at the different adventure sports like stuff that one can play, then went out to their canteen, where I had a snack and tea. All in all, a nice experience. What else? I plan to get myself an international driving license in the coming days; I plan to cook some interesting food for my family; I wish to complete the job hunt for myself and take up a job wherever destiny takes me; I plan to stitch some new clothes for myself; I want to meet my old school friends and GS friends ... if I can; I have other social obligations too. Let us see what things I can, and what I cannot, do. Thank you for reading my entry. Although the terms "KSA" and "Alcatraz" are not synonymous, the feeling is. The whole country has a culture that reeks of controls, of restrictions, of unforeseen demands, of untrammelled inhibitions and of hesitant progress. While expatriate males working in the Kingdom are free to move around almost anywhere, expat females are restricted to hostels or homes where ingress of males is prohibited. During the nearly four years of my existence, I felt like a free bird caged in something big - so big, in fact, that one could not see its shape or walls! My passport stayed with the Office of the Directorate of Health Affairs in Taif. Whenever I had leave for a few days or more, I went to Taif, and even further, with one trip to Al Baha and Abha, two of the many provincial capitals of KSA south of Taif. Twice, I went to Riyadh, once, for a recreational trip, and on the other occasion, to appear for part 2 of the MRCPCH exams. Even when I was cruising along the excellent roads in the Kingdom, my mind was diverted by thoughts of being found wrong somewhere or the other and getting caught. This is the refrain among all foreigners who work in the kingdom. Not just doctors or high-ranking people, but all classes of people and doing all kinds of work. This is, believe me, part reality and part perception - a perception created by the government through various forms of overt as well as subtle sign-posting. First of all, non-Arabic speaking people are already at a disadvantage because they don't know what is happening. Then, because they are unable to understand what they are being charged for, they are unable to give an explanation or wriggle out of a spot! Finally, to add insult to injury, at times, because of the frustration of being unable to defend oneself, they end up creating a scene, and added punishment is then conferred on them for their "inquiring", "oppositional" and "irritating" behaviour. These unfortunate thoughts vitiate the enjoyment one may get from earning more money. Rules are the same for Saudis and non-Saudis, but the implementation is totally different, except for the more serious offences. For example, in a road accident between two vehicles, the non-Saudi will be more often declared the guilty party; in a fist-cuff fight, the Saudi will declare himself to be the victim, and non-Saudi will be pronounced to be the aggressor. Hundreds of such examples may be given. In my village in Al Muwayh, several Saudis are known to be drug addicts and even alcoholics! Yet, they roam around scot-free. I was once charged for driving my car in the wrong direction (and it was just 15 meters), while children aged 10 and even 9 are often driving large MUVs without being apprehended, although the entire local police force is obviously aware of this regular flouting of the law. When it comes to healthcare administration, they have a Quality and Safety Department in every hospital in the Kingdom, but traditional thinking of holding doctors responsible for every medical error pervades the minds of all administrators and invigilators. They are quick to blame the health-care provider and penalise him/her with fines and such other stuff. I remember a case where even the nurse, who was merely following the doctors' orders, was fined for giving the correct medication, simply because she was on duty at that time. An old man who once fell in the ER was responsible for levying fines on all the ER nurses for "allowing" that fall to happen! And, we all know that such incidents are unavoidable in a complex system such as health-care. This brings me to the end of this entry. Suffice it to say that there are glaring deficiencies in the Kingdom of Saudi Arabia, regardless of the fact that its government is employing possibly the largest work-force from all over the world. Spending what might be my last evening in the Kingdom, I am humbled to retrospect and introspect about how things have gone for me since I came to this country. First of all, I know that this is perhaps the wrong blog where I should be doing this: it should be in my Arabia blog, so I am basically going to stick to easy reading here. I completed the last few tasks in the city of Taif. This included picking up my official ticketing papers from the Muderiya, then purchasing a ticket for my flight to India from Jeddah via Saudi Airlines. I also collected a recommendation letter from the office of the Patient Safety department of Taif, thanks to Dr. Mohamed Ragab Mohamed, the in-charge of PS in Taif. He was kind enough to help me, and issued me a good letter that I had formatted for him a few days earlier. In the evening, I went for a little window-shopping in the market behind the place where I am staying. It was a great experience. I did not yet buy anything, but will end up buying within a few hours. Browsing at watch-sellers' stores was very rewarding. I saw Citizen, Tissot, Rado, Seiko and other watches. Haven't yet decided to buy anything. That's it for now ... will update again later. The last four days have been very busy indeed, as I am trying to wind up my affairs here in the Kingdom. Several tasks still remain to be completed, but I am hopeful that I will be able to do so in the days to come. I visited Jeddah twice in the last 2 days, and had the occasion to meet my cousin Juzer and his family again today. This was my chance to renew contact with my ailing cousin. His contribution to my experience in KSA is immense, as he helped me find my way in the first few months. I admit I have been remiss in contacting him or in keeping in touch with him, but this is something that happens. We did manage to contact each other through social apps like Whatsapp from time to time. Discretion prevents me from talking about his health issues without having taken his permission; suffice to say that he hasn't completely overcome the problems that affect his health. His wife Memuna and his son Abi Talib are both extremely helpful to Juzer, as he is a bit incapacitated. I had work at the Insurance company (the one that has procured for me the comprehensive medical negligence policy); I had to request them to refund the money I have paid to them for the next 2 coming years. After this, I had to go to the Indian Chancery (the equivalent of the Consulate General) to pick up a certificate declaring that I have no adverse stuff pending against my name. I hope this letter will be okay in lieu of the Police Clearance Certificate (PCC) that the new job guys have asked me to bring, because the latter will be nearly impossible to obtain. The best guess was that it may take 10 more days for the police to come back with a rock solid PCC. I returned to Taif at eight p.m. ... and went for dinner later in the evening, before coming back and writing this entry. Do leave your comments for me.